Algebra’s importance cannot be understated, and practicing with printable algebra worksheets with answers is a sure way to succeed. In order to master any higher math topics like Trigonometry and Calculus, students need their algebra skills to be on point. The idea behind Algebra I is to build a solid foundation that can help you explore linear functions, equations, and inequalities. In Algebra I, you’ll also explore systems of equations, factoring and quadratic expressions, exponents and ratios. Once you have this solid foundation, you can move on to any higher-level math subject with ease. Stats? Calculus? Your Algebra tools will unlock your understanding of all the tools needed to succeed in later math classes! 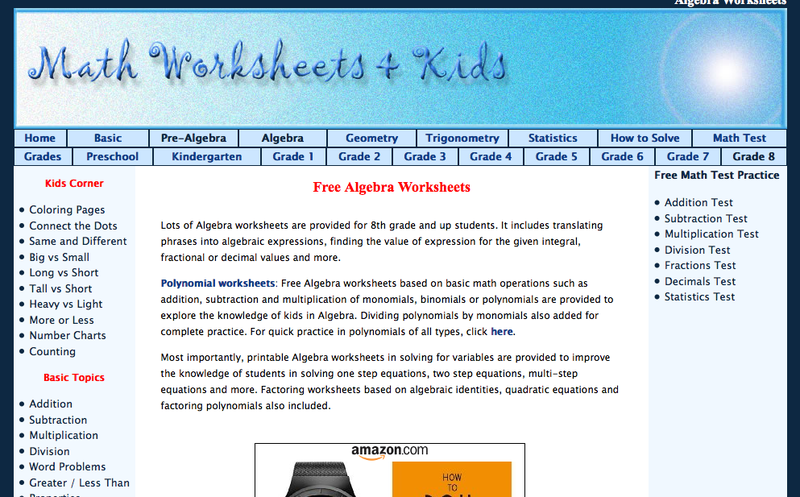 Kuta Software’s printable Algebra I worksheets are offered in 13 different categories, which are each divided further into 4-10 single sheets a piece. Each worksheet is non-customizable, but includes an answer sheet on a second page. 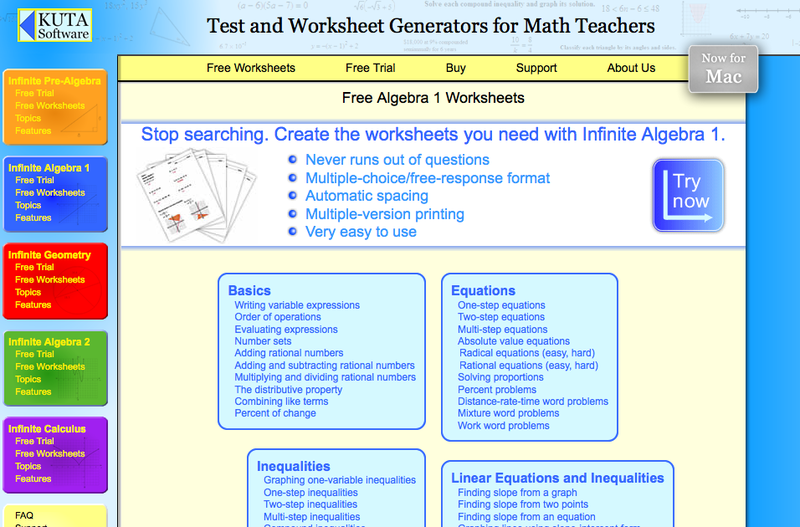 This website also has the option to pay for software, either for Windows or a Mac, to create infinite Algebra worksheets, but it’s pretty expensive (between $120 for a single user and $320 for a single school! ), so you might want to take the 2-week free trial and stock up on all the worksheets you could possibly need. SoftSchools has TONS of categories. But as you click through the different Algebra I-related links, you’ll eventually find yourself at a specialized worksheet generator that allows you to pick the number of rows and columns (and effectively the number of problems), as well as the style of font that you prefer. These randomly-generated worksheets also include answer keys, and SoftSchools Algebra I worksheets with answers are difficult enough to use for standard homework practice. 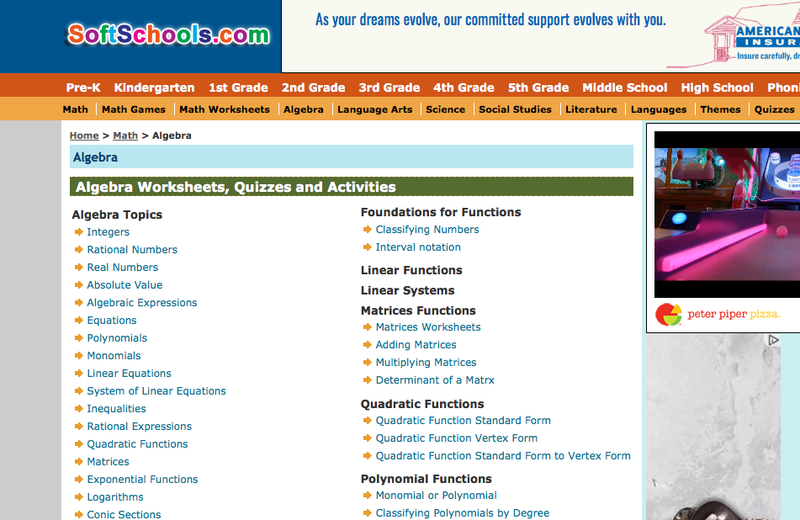 Math Worksheets 4 Kids is also mentioned in our 10 Best Pre-Algebra Worksheet Websites article, but their algebra I section is equally useful. One of their best features, by far, is their “exclusive” collection of fifty worksheets that allow students to practice translating phrases into algebraic expressions. This skill in particular will serve your students for years to come, because once they learn the skill of translation, word problems will no longer be frightening! Many of the worksheets have multiple versions of varying difficulty levels, and all include an answer key on the second page. 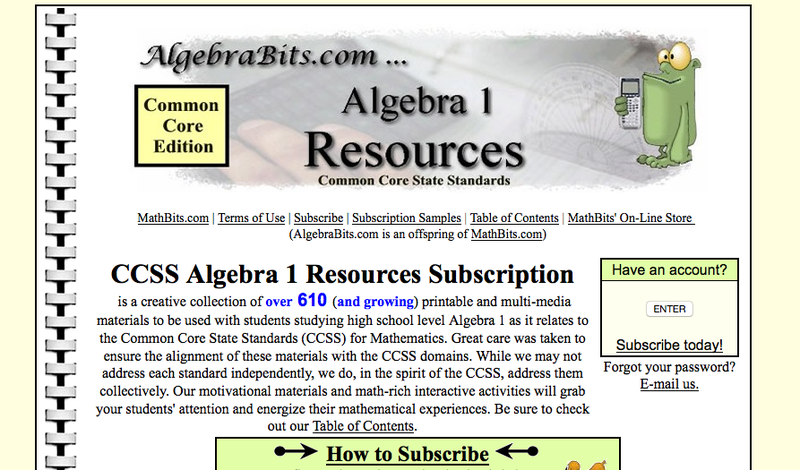 AlgebraBits does require a subscription (around $40/year, or $3.33/month), but they also provide five free sample worksheets. The only reason I’m including this one is because the worksheets are of relatively high quality—for example, they include a multi-page worksheet on standard deviation. These free materials can also be used for lesson materials, or class exercises. Or, the paid materials can be used to your heart’s extent! Math.com doesn’t mess around with categories. Instead, it’s one big worksheet generator. Pick from the number of types of equations you want (one-step equations, two-step equations, x’s on both sides, etc. ), the types of systems you want (solve be adding, subtracting, substituting, etc. ), and whether you want quadratics to be included. If you want some of your coefficients to be fractions, that’s another customizable option. Create as many of Math.com’s Algebra I worksheets with answers as you want—and it’s all completely free! 6. 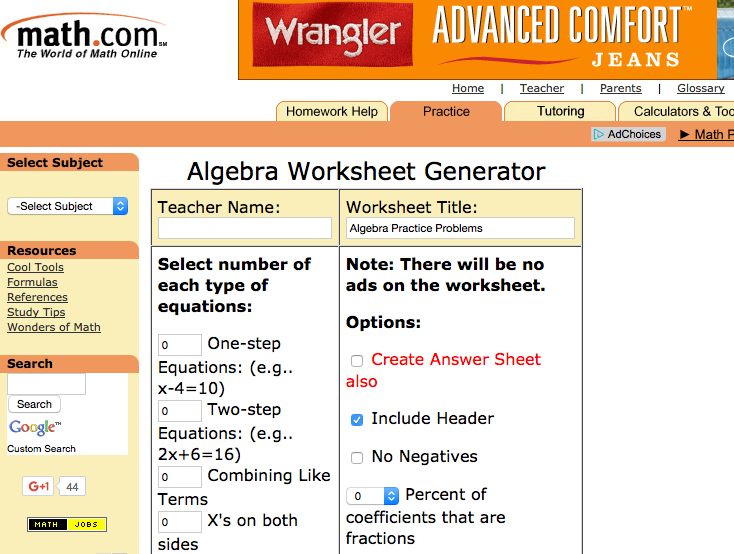 Printable Algebra I Worksheets: Math Worksheets Go! Math Worksheets Go! categorizes the Algebra I topics into 9 different sections, each with anywhere between 1-15 associated worksheets. Math Worksheet’s Go!’s Algebra I worksheets are also easily downloadable and include answer keys and fully-worked-out solutions that show each step. While these worksheets cannot be customized, the website does provide multiple YouTube tutorials for each skill. 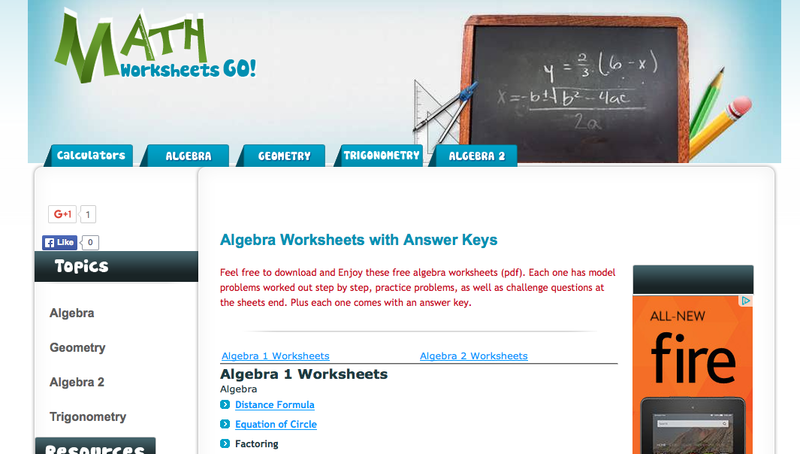 These six free Algebra I worksheet websites provide plenty of practice for the basic foundations of Algebra I, and are sure to help you on your quest to become a math master! Which website do you think is the most helpful? Let us know in the comments! I am glad you liked our website. We have recently added exclusives pages for evaluating expressions and simplifying expressions as well that contain enormous free worksheets in each topic. Thanks for the work you are doing to help students with math!